My BF and I decided to have an impromptu burger lunch today. 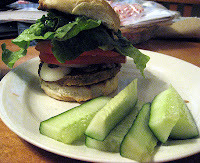 An omni, he grilled a meat burger for himself, while I enjoyed the Black Bean Chipotle vegan burger by Gardenburger. I topped my burger with an onion/mushroom/garlic mixture that we sauteed in a pan on the grill, and added cold tomato, more onion, red leaf lettuce and mustard on a sesame seed bun. We chose to have cucumber slices as a side (I sprinkled mine with a little bit of salt, yum!). Simple and quick!